Originally uploaded by Nicolas Gompel. Back in the spring of 2004, Jessica received a bunch of cash gifts for her bat mitzvah. We encouraged her to give some to charity and invest the rest. 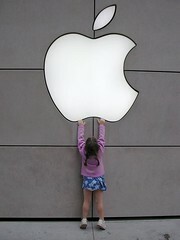 She wanted to buy Apple stock (AAPL). We agreed that was a good idea and she bought shares at $25/share. The stock has split 2/1 since, reducing her cost to $12.50/share and it currently trades at $75/share. That’s a sweet 6x in 2.5 years and Jessica is convinced she’s going to be in the hedge fund business when she gets older. I have to remind her that her other three picks (NOK, TWX, and GPS) have not exactly outperformed the market. When Emily found herself in the same place, she also chose to buy AAPL although she went with some other picks for the rest of her investment cash. She thinks Apple is still a great company and a great stock. I tend to agree. I myself don’t own AAPL but I did convert from a ThinkPad to a MacBook Pro in the past six months and I generally lean toward Apple products when I have a choice. Steve Jobs is one of those entrepreneurial CEO/owners who lead their companies with intensity and vision. Bill Gates used to be like that. Rupert Murdoch still is. Sergey and Larry might be on that list too. But I have a number of misgivings about Apple the company that keeps me from being a bigger fan of AAPL the stock. As brilliant of a marketer as Steve Jobs is, he’s also from the "control everything" school of technology architecture. OSX only runs on Apple hardware. You can’t play music bought from most online music stores on the iPod. And .Mac is the only online service supported by the iLife suite of products. What if I’d rather send my photos in iPhoto to Flickr? I can do that but not nearly as easy as I could send them to .Mac. For now, that approach doesn’t seem to be causing any problems for Apple, but I think openness is the winning strategy in the long run. Google is way more open with their technology than Apple is. And I think Google gets a lot of value out of that approach. Maybe Steve Jobs will wake up and smell the coffee, but somehow I doubt it. The reason I bring this subject up is AAPL is the stock of the day at Wallstrip (if you are reading this in my feed, click on that Wallstrip link). Howard thinks that the growing retail empire is the catalyst that’s causing the stock to be at its all-time high. I think the retail stores are another stroke of marketing genius. The stores in NYC are always mobbed. They are the closest thing to disneyworld in New York City. But the stores are full of people checking their emails and it’s not that easy to actually learn anything about the products there. I’d go to Tekserve or Digital Revolution over the Apple store for sure if I wanted information. And I’d much rather buy something at the Apple webstore than wait in the huge lines at their physical stores. That’s exactly what we did with Emily’s new MacBook. We picked the one she liked at the store in Soho and then left and bought it online later. So I am not sold that the retail stores are much more than a marketing expense for Apple. A smart one for sure. But maybe not the driver of growth that Howard thinks it is. So back to AAPL the stock, I think its certainly a good stock to own and I am happy that my kids are Apple shareholders. But I worry about the long term sustainability of the current momentum the company has. Is the iPod franchise at risk of being commoditized by low end players? I think eventually it will be. Is the web going to eventually be the OS? Yes, I think it will be. Will Apple be cool forever? Who knows. So I am long AAPL, sort of.